Casa Coronado is a large (4000 square feet), elegant home, located in a peaceful neighborhood in El Centro. The area: We are just a 10 minute walk to El Jardin and La Parroquia. Our home is close to some of the best language schools in San Miguel (including Warren Hardy and Centro Mexicano). The Mercado de San Juan de Dios and numerous fresh markets are just a couple of blocks away. It is easy to hail a safe and inexpensive taxi should you desire to do so! Our Home (Your Home Away From Home): We are constantly making investments to keep the property fresh and inviting. A number of our guests return year after year and we use their input to make sure the house has everything you need to enjoy a great family or group retreat. The house has high speed Internet, Dish TV, safe and modern heating, and Toll-free calling to the US and Canada. -This open concept 1st level flows through French doors into a beautifully planted, private garden. The garden has plenty of seating for entertaining, open air meals, reading, or just relaxing in the sunshine. - A large, private, and very comfortable roof-top terrace. The terrace has great plantings and ample seating for casual meals, entertaining, or just relaxing while watching the beautiful San Miguel sunsets. Our team: We are fortunate to have a group of wonderful people who have been with us for several years. Our Property Manager (Andres) is a degreed engineer who speaks fluent English and is a great resource for our guests. Our Housekeeper (Ana) consistently gets great reviews from our guests. Ana comes in three days each week to take care of the casa and the laundry. The third member of the team is Mario (our gardener/handyman) who does a wonderful job taking care of the garden and all of the property’s plantings. Property Overview: The property runs street-to-street and consists of the Casa, the beautifully landscaped garden, the garage, a game room and a laundry room. The property also contains the Casita with its own private street entrance and rooftop terrace. The Casita (see VRBO listing 209115) sleeps three and can be rented with the Casa if you have a large group. San Miguel de Allende has added a new facet to our lives. While we love the year round temperate climate, the people and culture are what drew us to San Miguel. After living in the South (too hot and too humid), in California (we really don't much care for earthquakes), the Northeast (too congested), the Pacific Northwest (too wet), and currently residing in Minnesota (too cold),the temperate climate of San Miguel is 'just right'! We thought about settling down in Arizona but gave up the idea when we realized that we would be trading too cold for too hot and that the whole area is just Minnesota with sand. Our house is located in a friendly, safe, convienent neighborhood. Our Property Manager (Andres) speaks perfect English and our guests consistently comment on how helpful and friendly he is. Our housekeeper (Ana) is here three times each week and has been with us for five years. Ana does a wonderful job taking care of our guests and home. San Miguel is located at 6000 feet in the mountains of Central Mexico! We have modern "vented" (exhausts outside of the house) Rinnai wall units in each of the bedrooms and in the living area on the first level. Wonderful garden with fountain just off the breakfast room, plenty of seating (including new lounge chairs) to enjoy a light meal or to just spend time in the sunny garden. The house is very pleasant, 5 minutes walking distance of the center. Comfortable house, great staff, Anna the maid was very nice and helpful. John the owner was in town when we checked in late the night, he gave us a tour of the house and recommends great restaurants. I will recommend highly to stay there. Thanks Pascal - would love to have you guys back anytime! Wonderful time at a wonderful property! This home worked very well for our extended family. The location is super convenient, and the accommodations are first class. 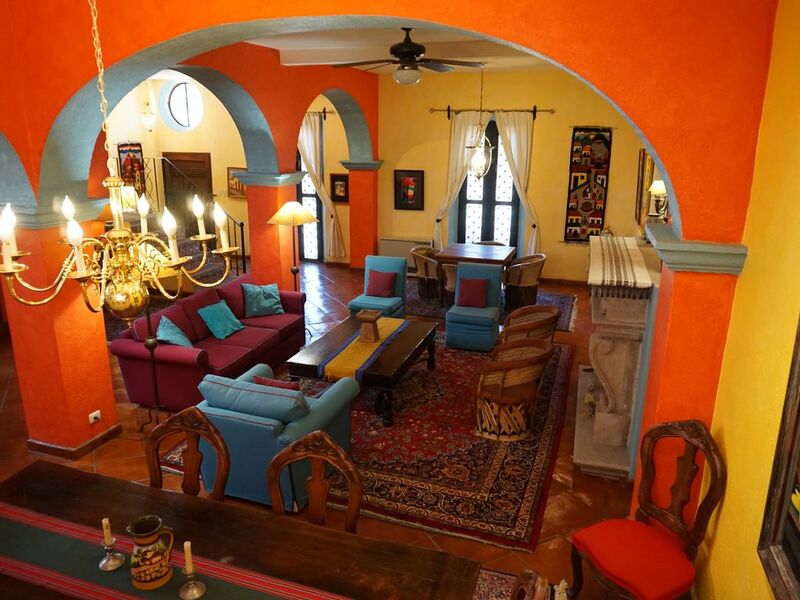 San Miguel is a wonderfully inviting and charming place, and this home matches that vibe very well! John the owner is also extremely flexible and took care of some shifts in our arrival and departure dates with no issue. In short, you can't go wrong with a visit to San Miguel, and this home is a wonderful choice if you have a large group for the visit! We spent three weeks in San Miguel de Allende, Mexico and knew from the minute we walked in that we had found the right house for our stay. The 3 bedroom, 3 1/2 bath house had every amenity that we needed including heaters in the bedrooms and living room, a rarity we discovered. The house is so colorful and comfortable complete with a housekeeper, gardener and house manager. And the location was perfect--just a short (and uphill) walk to the town jardin/square. The home owner answered our many questions promptly. We definitely would stay here again. My husband, kids, mother, and friend stayed here for three nights over New Years this past year and we loved it! It was huge, perfectly decorated, and located close enough to town that we could walk (although we sometimes took a taxi up the hill to town). There is a fantastic rooftop terrace that we spend a lot of time on, including watching the fireworks on New Years Eve. It has a great view of the churches in the centre. I loved the Mexican decor, which was throughout the house in every detail. We loved San Miguel, and will definitely come back. We only wish we had more time, but would definitely recommend this house to everyone. Thanks again! This is our second year at this home. From John the owner to Andres and Anna you immediately feel at home. The house is beautifully furnished and provides you with the feeling of being in your own home. It is readily accessible to everything. This is a very special place where everyone tries to make you feel very welcome.